Bradley Wilson-Dean on his way to victory for Panthers against Redcar. Skipper Ulrich Ostergaard has told SGB Championship KO Cup rivals Redcar that Panthers will not be intimidated. The two clubs meet in the second leg of a preliminary round showdown in the North-East tonight (Thursday, 7.30pm). Panthers travel to the Media Prima Arena in possession of a 10-point aggregate advantage following a spicy clash at Alwalton last Sunday. 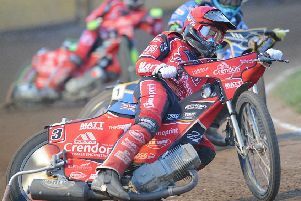 Redcar were left unhappy following the loss of German rider Tobias Busch to an ankle injury after a back-straight crash in heat five, when he was attempting to squeeze past Ostergaard. And there were shenanigans after the final race when Bears man Ben Barker appeared to deliberately ride into Panthers number one Jack Holder, causing him to fall. Ostergaard said: “I made a cut-back coming out of the second bend and was following my partner. I didn’t see Busch and I didn’t touch him at all. “Riders always have the chance to shut off if they are going for a gap that is not there. I’ve been in that position many times myself. “No-one wants to see riders get injured, though and hopefully he is back racing soon. “I didn’t see what happened after heat 15 myself, but Jack was furious. People were saying that Ben just rode into him and damaged his bike. “To do that kind of thing is stupid and I think he should be fined for it. There’s no need for it. Speedway is a family sport. “There was apparently a comment from someone with Redcar earlier in the meeting that they were going to look to nail us, but we won’t worry about anything like that. “We won’t be intimidated. We’ll just focus on riding our bikes as fast as we can and hopefully getting the result. “We’ve got a good record up at Redcar and it’s a track that the vast majority of guys like to ride. Ostergaard also hit the deck twice himself last Sunday – once in a tangle with Busch moments before the visiting rider crashed out - and again in heat 14 when losing control going into the opening bend. “It was all so quick that I’m not sure what happened in heat 14,” continued Ostergaard, who hurt his left arm. “The bike just took off and luckily I was able to get off the back of it. “The last time something like that happened to me a couple of years ago at Scunthorpe I couldn’t get off the back and I smashed into the fence. Panthers are without high-scoring reserve Bradley Wilson-Dean due to a fixture clash with his SGB Premiership side, Swindon. They have turned to Nike Lunna, of Glasgow, to deputise. He’s ridden capably at the Redcar track in the last couple of seasons. Redcar have made a short-term team change by drafting in Argentinian ace Fernando Garcia to cover for the sidelined Busch. They are also without a reserve as Ellis Perks rides for top-flight Rye House. Josh Bailey, another young Brit, is their choice of guest.